Featured by Steam World magazine as the Review of the Month for December 2015. You'll be £15.00 closer to your next £10.00 credit when you purchase A Privileged Journey. What's this? 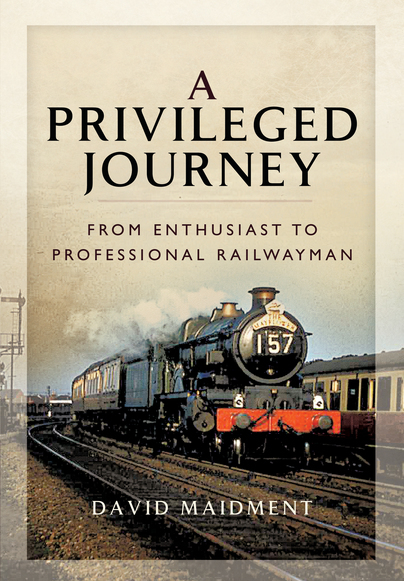 A Privileged Journey: From Enthusiast to Professional Railwayman is a personal account of the author's youthful enthusiasm for trains, travelling throughout Great Britain and Europe as a student and management trainee of British Railways. The book is illustrated with over 140 black and white photos, mostly taken by the author during his travels. The chapters cover the emergence of the young boy's interest in steam locomotives, through his early 'trainspotting' days to his numerous journeys in the late 1950s and early 1960s, with many accounts of locomotive performance supported by an extensive appendix of train logs. Some of the chapters are much extended narratives from articles serialised in the UK enthusiast magazine 'Steam World', and are also based on ten hours of verbal interviews recorded by the UK National Railway Museum at York as part of their Oral History archives supported by a UK National Lottery Grant. The second volume (covering the period from 1962 to the current time) will describe his continuing interest and records whilst pursuing his career as Stationmaster, Area Manager, Train Planner, Regional Operating Manager and finally Head of Safety, followed by his retirement in 1996 and subsequent career as an international railway safety consultant. David Maidment has published a number of entertaining and insightful magazine articles over the years, and it is these that form the backbone of this publication, with all proceeds of this enjoyable read going to the Railway Children. What this book does, with new text, is cleverly tie his story together into a cohesive timeline. As featured on Amazon Books and given a 5 Star rating! The author has re-embarked on his privileged journey as a youthful enthusiast into a career in the railways. There is a second volume promised to take the story on from the 1960s to today. Together, the two volumes will make a unique account of railway life and technology. This first volume is a fascinating insight into what is now something of a lost world, but still a world of dreams and love of steam. Strongly recommended. Not many people have the satisfaction of seeing their hobby become their life's work and whether you are a former trainspotter or not, many people will be grateful to David Maidment for sharing with us his rail journey so far. David has had a privileged journey, and it's a privilege to read the first volume of his memoirs. We're looking forward to the next part. As seen in Buses magazine, this book is a must read for all railway and transport enthusiasts alike.